This microphone stand can be unscrewed and replaced, is good for using at the conference room, church, the other public place. Easy fold-up modern design. Universal mic clip design can fit many mic models. The Tiger Tabletop Microphone Stand features an interesting tripod design which provides maximum stability and durability. Fully height adjustable, this microphone stand is ideal for seated musicians with a height ranging from 14cm to 19cm. Pulse - Microphone Table clamp. • 5/8" Screw-thread adaptor included. • 3/8" Threaded bolt on top of clamp. • Clamp capacity: 43mm. Why Buy From Us?. • External Depth: 45 mm. • Colour: Black. • Weight: 0.260. 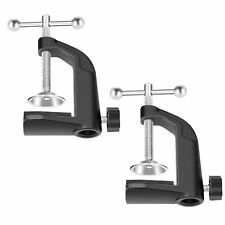 Neewer® Heavy-duty Metal Table Mounting Clamp for Microphone Suspension Boom Scissor Arm Stand Holder with Adjustable Positioning Screw, Fits up to 1.97"/5cm Desktop Thickness--Black (2 Pack) Features: Two mounting clamps included,providing you a convenient replacement Specially designed table mounting clamp for universal microphone suspension boom scissor arm stand. Heavy-duty metal clip base provides a sturdy and reliable way to hold your microphone stand. Features: Pop Filter: Essential item for recording, speaking or singing. Double Layer Mesh Screen can demolish problematic plosives and avoid distortion to provide a clean and professional recording. 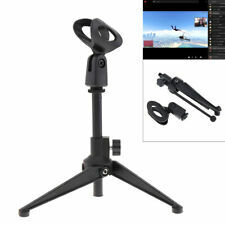 Desktop Tripod Stand: Equipped with super-stable Tripod Stand so that your microphone can be held safely and firmly. Shock Mount Mic Holder： Ideal for radio broadcasting studio, karaoke, home recording, and voice-over sound, etc. Specification: Color: Black Material: Zinc Alloy ABS Plastic Pop Filter Diameter: 6.69 inches/170mm NOTE: 1. Microphone and Mic Cable are not included. 2. The Holder is suitable for microphone of diameter 20-42mm. PLEASE CHECK the size of your microphone BEFORE ORDERING. Package Includes: 1x Pop Filter 1x Shock Mount Mic Holder. 1 x Microphone Stand. - A variety of accessories, easy to carry, easy to assemble, flexible rotation angle, free to assemble. As the custom fees and policy are different in different countries, you'd better check it your custom office. Steel alloy tripod ensures the microphone is secure and stable on your desktop. 1 x Microphone Stand. Foldable compact design. Steel tube construction. Our online presence were growing on a huge scale. Over the course of 2015 DY Pro Cables quickly got a hugereputation for itself for providing high quality products on a very quick service. This table microphone-arm for studio microphones is ideal for condenser microphones or other. The microphone-arm is fully in height adjustable and easy to clamp on the table. The built-in balanced XLR cable leaves your cable out of sight. Main Features Adjustable black microphone-arm Easy to clamp on the table Built-in balanced XLR cable. Table Top mini Microphone Stand with rubber feet. If you are searching for a table microphone that is handy yet durable, look no further than the Pronomic MST-5S table microphone. Pronomic MST-5S Table Microphone Stand. Have fun with your microphone! Overview -Desktop Microphone stand with cast base, includes mic holder for a standard ‘SM58-Style’ microphone, suitable for most handheld microphones. Features- Compact, stylish design makes it ideal as a permanent addition to your workstation. Overview – Microphone stand with a round base for sturdy balance and detachable gooseneck arm. This stand is height adjustable. We specify the components of our products. We bring them to you for excellent prices. Ideal for conference and studio use. Desktop Microphone Tripod Stand. Supplied with 3/8" to 5/8" thread adaptor and 5/8" mic holder. Adjustable height. Couple of marks from use but in top working order. Please ask any questions and see my other items as I’m having a clear out. 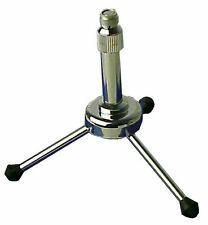 Overview – Microphone stand with a round base for sturdy balance. This stand is height adjustable and is supplied with a microphone clip. Colour – Silver stem with Black Base & Clip. We specify the components of our products. Overview – Microphone stand with tripod base for excellent equal balance, includes a 15mm thread adapter for holding various microphones. This mini stand is height adjustable. We specify the components of our products. Stable, foldable tripod design. 1 x tripod. Black table stand with microphone clip. Malone ST-4-TAB Table Stand with Microphone Clamp Black. The universal mount is suitable for most common microphone designs. Made of high quality aluminium alloy and stainless steel with a thickness of 4mm so don't worry about breaking. - 1x Table Clamp. Suitable Table Thickness: 2.5" / 6.3cm (Max). Weight: 340g. Mini Microphone Stand. 3/8” & 5/8” Thread. We specify the components of our products. We bring them to you for excellent prices. We do the hard work of sourcing the best quality cables. The MST-20 can be used in any situations where you need to mike on a desk or table. The Pronomic MST-20 doesn't just looks chic. It is strong and stable in almost any situation. The stand legs are fitted with soft rubber linings that have an anti-slip effect and absorb minor shocks. 4 used K&M Table mic Stands, these are the heavy models with the sound insulation. Cast-iron base with 3/8” thread. IMPORTANT INFORMATION. OTHER IMPORTANT INFORMATION. Be sure to add us to your favorites list!